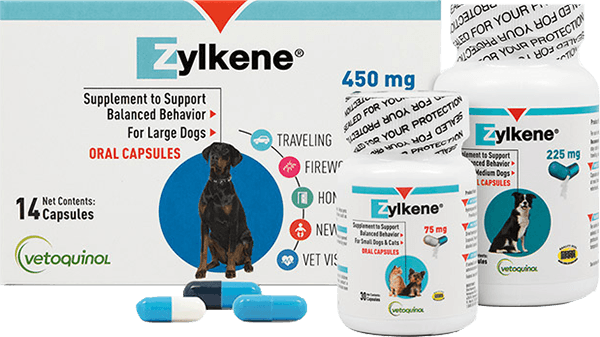 Zylkene® is a behavior supplement that helps dogs and cats relax, adapt to new locations, or cope with challenging situations — without making them drowsy. And since Zylkene® can be given whole or opened at meal time and can be used for short- or long-term use, it’s the perfect supplement to help your pet face life’s challenges. Whether your pet is visiting the groomer, the vet, or moving to a new home with you, Zylkene® can help them stay calm as they adjust to new environments without modifying their behavior or making them drowsy. Fireworks, thunderstorms, and travel: few things are more stressful to your pets. That’s why Zylkene® is the perfect supplement to help pets stay calm without sedation, which makes new situations easier for them – and for you. Is company coming over? Do you have a new baby in the house? With Zylkene®, your pets can calmly adjust to new additions to the family – or just friends coming over to visit – without stressing out about it. Capsules can be administered orally as a single dose, whole or opened at meal time. Use as recommended by your veterinarian. Short-term use: Use Zylkene for 1–2 days before a planned event or change in environment. Some animals may need earlier administration (5–7 days). Consult your veterinarian before giving your pet Zylkene. Follow the recommended administration on the package, unless otherwise instructed by your veterinarian.